Damaged hard drive or its controller. The integrity of the system files is corrupted. There is no contact between the hard drive and the motherboard. Errors in the downloaded Windows build (it is better to use the original Windows images). Incorrect disconnection/connection of a removable storage device (USB drive, external hard drive). There is a problem with the device from which is installing Windows (for example, a USB flash drive). Generally, this error code occurs because the computer can’t communicate with the hard drive. Another cause is the SSD (Solid-state drive) issue when installing Windows. If there are some external devices connected to the PC, such as the external hard drive or a USB flash drive, disconnect them all (leave the mouse and keyboard connected), then restart the device. If there is no more error code 0xc00000e9, plug external devices back, only one at a time, then restart your PC. If the error code appears again after connecting the certain device. Then either replace this device completely from PC or update its driver. Shut down the computer, then press the Power button to boot the computer. Press and hold the button to enter the BIOS setting, generally the ESC, F2, F12 or Delete key (please consult PC manufacturer or go through the user manual). As enter in the BIOS Setup Utility screen, go to Boot options. In the Boot options, make sure the first boot device is the hard drive. Press the arrow key to highlight the hard drive and move it to the top of the boot device list. Save changes, and reboot the computer. This should fix the problem. 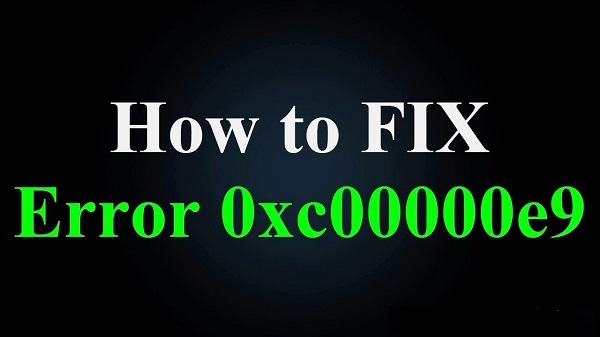 0xc0000001 Error Code on Startup: The 0xc0000001 error can be caused by a wide variety of causes, with the most common one being system file corruption or damaged memory. Alternatively, this error can also be caused by a missing or damaged SAM(Security Account Manager) system file. Startup Error Code 0xC0000225: In Microsoft Windows Operating System this error when it can’t find the correct system files for booting. This vital information is known as Boot Configuration Data or BCD.